Morgan’s charges per canoe. 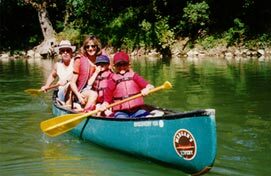 A canoe will accommodate up to 3 adults or 2 adults and 2 small children, however there are only 2 seats per canoe. Additional people sit on the bottom of the canoe on a cushion, if available. Be aware that other canoe rentals charge per person and hide other costs that you will find out about only after you arrive. Prices quoted are based on the upgraded Old Town Canoes. Aluminum canoes are available for $5 less if requested. At Morgan’s we guarantee the most competitive price on the river, and will customize a trip to fit any budget. Please TALK TO A MORGAN family member personally to advise you on your outing and to work out all the details to make a successful trip. Morgan's is happy to shuttle your private canoe for $20.00/canoe and $15.00/kayak. Please note timing and availability for shuttles are dependent upon our boat rental customer's trips. You and your boat will be transported at the same time as our regular customers. September and October trip schedules can change on a daily basis, based on conditions and reservations. PLEASE call ahead in the morning to double check our departure schedule! The pricing below is our reservation rate, add $6 per canoe for our regular walk-in, non reservation rate. Add $5 additional to reserve an upgrade to an Old Town canoe. All coupons are honored based on the regular rate, certain restrictions may apply. Coupons are not honored on holidays or holiday weekends. Prices are subject to change without notice. Tubing is $15.00 ($11 with a reservation) for this trip. Two Day Trip: Combine two or more of any of our trips to customize a two day river experience. Base camp at Morgan's and become familiar with our area and facilities. Beautiful swimming beaches are adjacent to our campground, horseback riding and antiquing are also close by and are great ways to lengthen your stay with us and enjoy the area.